PE Creative: Hold the back page.. 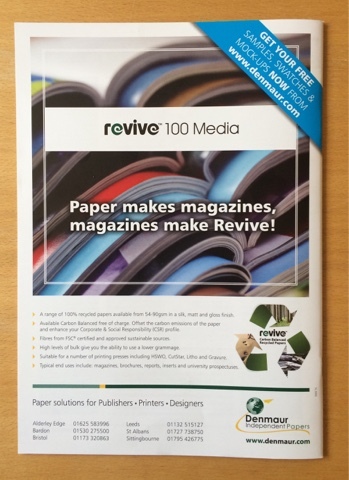 This quirky back page advert was created for Denmaur to promote their much loved Revive brand recycled paper. The advert appears in a number of creative and print related press publications. The cost of producing adverts has reduced dramatically over the years. It's buying the media that costs the most...however with a digital mix your advert reach can go a lot further. For example this advert also appears on linked in, Facebook, along with a range of industry focused websites. To discover best way to get the most out of your marketing budget give us a call now on 01332 29114 and we can help you!